Women’s boxing sensation Claressa Shields has been named a top-10 finalist for the 2018 Individual Sport “Sportswoman of the Year” by the prestigious Women’s Sports Foundation. The two-time Olympic Gold Medalist and now two-division professional World Champion will be looking to repeat as winner this year, as she already won the award in 2016, after her second gold medal victory. Finalists were selected based on athletic performances between August 1, 2017, and June 30, 2018. The public and the Women’s Sports Foundation’s Awards Committee will select the award winner. She will be the athlete who receives the highest combined share of online public voting (50% of composite) and the Awards Committee vote (50% of composite). Online voting runs from July 23 to August 3 at 11:59 p.m. (EST). A pillar of her community in Flint, Michigan, as well as a tireless advocate for women’s boxing and athletics in general, 22-year-old Shields has rocketed to superstardom and become the face behind the resurgence of women’s boxing. 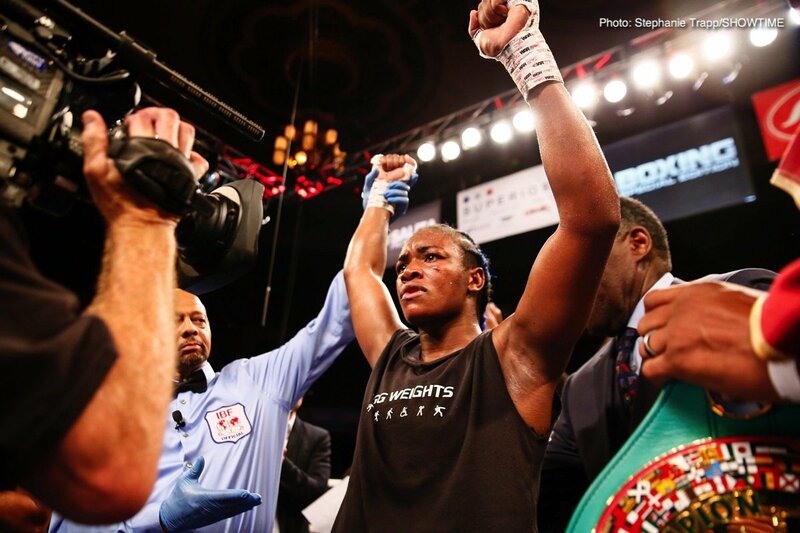 In just six professional fights (6-0, 2 KOs), the popular Shields has won the unified women’s 168-lb Super Middleweight and unified women’s 160-pound Middleweight championships. In her last ring appearance, held on June 22 and broadcast live on Showtime Championship Boxing, Shields’ match drew higher ratings than a World Heavyweight Championship unification match held earlier this year. Founded in 1974 by tennis legend, Billie Jean King, the Women’s Sports Foundation is dedicated to creating leaders by ensuring all girls access to sports. Past winners of Women’s Sports Foundation awards include Venus and Serena Williams, Abby Wambach, Meryl Davis, Simone Biles, Yani Tseng and Candace Parker. While a number of female athletes have received multiple nominations, few have been able to repeat… but Claressa Shields loves a good fight. The Women’s Sports Foundation’s 39th Annual Salute to Women in Sports will be held on Wednesday, October 17, at Cipriani Wall Street in New York City.